The May 2013 issue of Tabletalk features articles examining the heart of Israel’s confession of faith as found in Deuteronomy 6:4–9. 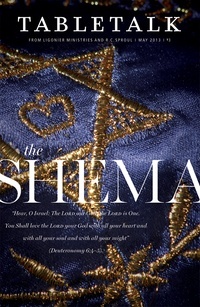 The opening words of this passage, known as the Shema, have been repeated by the faithful for millennia: “Hear, O Israel: The Lord our God, the Lord is one. You shall love the Lord your God with all your heart and with all your soul and with all your might.” In these words, God reveals to His people something fundamental about His nature as well as what is required of us in light of who He is. Our Lord Jesus, when asked, “What is the greatest commandment?” quoted these words. They remain as relevant as ever. Contributors include R.C. Sproul along with Bryan Estelle, Robert Rothwell, Mark Jones, Curt Heffelfinger, Michael Morales, Miles Van Pelt, Nick Batzig, R.C. Sproul Jr., Sally Lloyd-Jones, W. Robert Godfrey, Geoff Stevens and John Piper.